This entry was posted in Uncategorized on August 10, 2018 by dk. Our mind-body connection is far more powerful than we realize. Our thoughts influence our emotions and how we experience the world around us. Even when we imagine future situations or visualize potential outcomes, our bodies physically respond to our thoughts. Think of how you react when someone cuts you off in traffic and nearly causes an accident. The incident may only last a moment, and, at that instant, your body immediately prepares for the potential outcome, triggering a surge of adrenaline, which is the body’s hormonal response to a fight or flight situation. This sort of physical reaction isn’t limited to a release of adrenaline. Our thoughts can trigger our bodies to experience all types of physiological responses from changes in blood pressure and heart rate to chemical alterations in the brain. These changes can be harmless, or, over time, they can be detrimental to your health. In 2013, a study was conducted on 270 patients looking to alleviate severe arm pain. Half of the subjects received acupuncture treatments, and the other half received pain-reducing pills. Some side-effects experienced in both groups, included an increase in pain, sluggishness, swelling, and redness. Both groups found relief with treatment, but those who received acupuncture reported feeling even better than the group that did not receive this treatment. However, the study was not designed to measure the effectiveness of acupuncture versus pain pills — the needles had retractable shafts and never pierced the skin, and the painkillers were made of cornstarch — it measured the power of placebo. Imagine! Even without any actual treatment, the body still reacted according to what each patient expected. Of course, you cannot think yourself better to remove a tumor or cure a virus, but researchers have found that the power of the mind can have a physical impact when it comes to pain, depression, anxiety, fatigue, and even some symptoms of Parkinson’s. Our brain chemistry is also affected by those around us. In another study conducted at the University of Turin Medical School, 100 students went on a trip to the Italian Alps with the researcher Fabrizio Benedetti. Shortly before the trip, Benedetti told one individual in the group that the thin air may cause migraines. A few days passed, giving the rumor time to make the rounds to one-quarter of the travelers – all of whom experienced horrible headaches. Saliva tests on the “socially-infected” individuals also revealed low oxygen conditions beyond what was expected. Now, apply that study to our everyday lives and how gossip and social media “snark” can poison our minds. What happens when family and friends fuel your negative expectations, worries, and doubts? It feels horrible, doesn’t it? And what about the opposite – what happens when your loved ones surround you with warmth and encouragement? It feels amazing and makes life’s challenges feel more achievable. Embracing positive social support makes a difference to your health! Play along for a moment and allow yourself to take in a long conscious breath. Feel how the air moves through your body as you inhale and exhale. Now take another full deep breath. How do you feel? Did time slow down a little? Did you enjoy a brief moment of peace? Or did you not play along at all, anxious to move on to the next thing? If only we lived breath by breath instead of task-by-task! Our “to-do” lists will never be empty, so we must schedule time in our day to reconnect with ourselves. We act like finding time to meditate is beyond our control. It isn’t. And the results are worth it! Spending a moment in meditation each morning is one of the best things you can do for your health and well-being. Even if only for ten minutes, it is an investment of time you’ll never regret. By starting your day on the right track, it makes it that much easier to get yourself back on track whenever life goes off the rails. Meditation deepens your connection to yourself on a physical, mental and spiritual level. Meditation helps to release suppressed emotions by giving you space to reset. 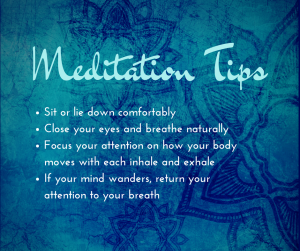 Meditation enhances our overall health and well being by increasing positive emotions and improving immune function. Studies have also shown that when we work on our emotional awareness and self-compassion, we can experience a healthier response to rejection, improve eating behaviors, and effectively manage weight loss. No matter your struggle, success always begins with a positive frame of mind. 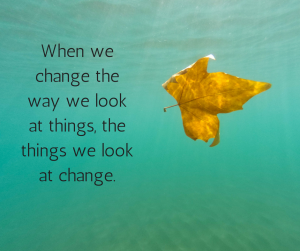 Stress is not inherently negative – it all depends on how you look at things. If you perceive something as a threat, then your health will deteriorate. However, if you simply change your mindset from threat to challenge, then you enhance your health! So, ask yourself — are you running away from a lion or are you embracing the beast? Emotions are only energy in motion. Instead of thinking of your emotions as a hindrance, consider them the currency required for the motivation to change. Unresolved feelings don’t atrophy or disappear – their dammed-up energies accumulate. Like an untreated health condition, if your emotions are allowed to fester inwardly, they will eventually cause physical conditions and behavioral issues. Both negative and positive emotions left unresolved will deplete the body’s immune system. Acknowledge your feelings and learn how to manage them effectively. Managing emotions leads to homeostasis in the body, centeredness of mind, and spiritual connection. Remember, if there are no peaks or valleys, you’re flatlining! Do you find yourself entrenched in negative thought patterns? Do you think some of your health concerns might be related to your outlook on life? Let’s discuss and see if we can uncover the triggers behind your health issues and develop strategies to overcome them together. Contact me and we can start working on bringing you back to your best. Call or email us at 905-852-7969 or [email protected]. Is Alcohol Really a Detriment to Your Health? Ready to stop your headaches? Are you are not in the mood anymore? Is Fasting Healthy For You or Another Fad Diet? Should We be More Cautious With Electronics? Can your thyroid be the reason you can’t lose weight? Understanding Lectins and how to properly prepare them.